Zig zag part are fun. Zig zag braids are created by using parts that are zig zagged instead of straight. The hair is then braided in the direction of the parts, so the hair is actually zig zagged in this cornrows braid styles. Some people simply part the hair in zig zags and braid the cornrows straight, but when people discuss zig zagged braids, they probably mean that they would like the entire cornrow to appear that it is zig zagged. The style was created to add style to plain cornrows. Basketball players have probably popularized zig zags, because the style has often been spotted on the court. A basic zig zag style entails parted the hair in the zagged parts and braiding the hair in cornrows from the top of the hair where it begins near the forehead to the back of the head. 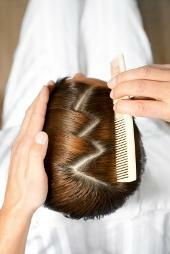 To begin zig zag braids, first create a zig zag part. The hair can be parted in the center or on the left or right side, depending on where the first braid will begin. Next, pick up three strands of hair and begin braiding towards the nape of the neck, picking up additional hair as you go. Create a second part and braid, while turning the hair into a zig zag position. The most challenging part of zig zag braiding is keeping the braid uniform and neat while making the turns. Keep the hair that you are braiding away from the rest of the hair to avoid picking up hair that you did not intend to pick up while braiding. The ends of the braids can be secured with a rubber band if it is likely to unravel. Some people simply braid the hair to the ends and avoid using any holders because the hair is likely to keep the style. How Long Does it Take to Zig Zag Braid? These braids are usually medium-sized; they are not particularly small braids, therefore, the style can usually be completed within a couple of hours, depending on the style and the thickness of the person's hair. A simple zig zag braid style will probably take an hour or less to complete, if the stylist is skilled at parting the hair and braiding it. Zig zag braids do not simply have to go in the front-to-back direction. Braid the hair into a ponytail using zig zag parts. The back of the hair can be braided upwards and the sides of the hair can be braided to meet the back. People with shorter hair can use add synthetic hair to their own hair for fullness and a long thick ponytail. If you do not want braids throughout your hair, simply part the top of the hair up to the crown in zig zags. Braid the hair from the forehead to the crown and leave the rest free. Use rubber bands or tiny hairclips to keep the braids from unraveling. Curl the back of the hair under for a sleek style or add tiny spiral curls. Create a zig zag French braid by braiding the hair up and towards the center with or without synthetic hair. Next, braid the ends down the center in one large French braid. Zig Zag braids can go in any direction. Braid the hair to the side and curl the loose ends of the hair. Zig zag novices can first learn how to create the zig zagged parts and plait or cornrow the hair straight. Next, try to learn how to create turns that follow wide zig zagged parts. Zig zag braids are a great style for the summer or any time of the year. The cornrows allow the scalp to breath while keeping the hair secure in a protective style. Zig zagged braids also look stylish on both men and women. It takes practice to learn this style, but with a patience and time, if you can cornrow hair, you can pick up zig zag braiding.